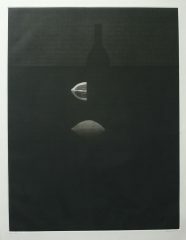 Yozo Hamaguchi, printmaker,is one of the finest mezzotint artists. Hamaguchi studied sculpture at the Tokyo Art School in 1927, but abandoned his studies in 1930 to go to France. In 1939, on the onset of the Second World War, he returned to Japan. Hamaguchi returned to France and settled in Paris in 1953.It was whilst he was in France that he began making copperplate etchings. From 1955 he began producing black and white and colour mezzotints. He was awarded prizes at the Sao Paulo Biennale and the first International Biennial Print Exhibition in Tokyo in 1957. His first solo exhibition in 1985, comprised over 160 prints, was held in Japan, at the National Museum of Art in Osaka. Hamaguchi’s mezzotints and virtuoso works have led to the present day popularity in this technique.